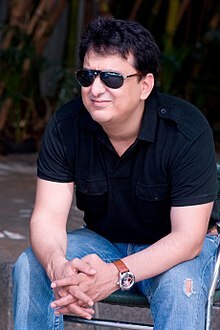 Sajid Nadiadwala (born 18 February 1966) is an Indian film producer, storywriter, director, and owner of Nadiadwala Grandson Entertainment. He is the grandson of filmmaker A K Nadiadwala, and has written and produced films including Housefull (2010), Baaghi (2016) to directing Kick (2014) that brought him various debutant director awards, and wrote the Marathi film Lai Bhaari that was produced by Riteish Deshmukh. He has produced films like Judwaa 2, Highway, 2 States, Baaghi, Heropanti, Mujhse Shaadi Karogi, Jeet, Judwaa, Har Dil Jo Pyaar Karega, Tamasha, and Dishoom, Sajid is one of the top independent producers in India. Sajid Nadiadwala's grandfather Abdul Karim Nadiadwala came to Mumbai from a city called Nadiad, Gujarat in 1955. His grandfather produced hundreds of films in Mumbai, including Taj Mahal. The family's base was in Malad, where his grandfather owned theatres, and where they had more than 5,000 acres and streets named after them. Hence, Sajid used to watch films since he was a child. Sajid's father also produced films. Sajid completed his CA and law and later joined J.P. Dutta as an assistant director on Ghulami at age 21. Sajid started his career at a very young age, as a production assistant in his uncle's production house before establishing his own production company called "Nadiadwala Grandson Entertainment Pvt Ltd" at the age of 25. In 1992, he produced his first film Zulm Ki Hukumat starring Dharmendra and Govinda. He brought together action stars Akshay Kumar and Suniel Shetty for the first time on big screen with his next, Waqt Hamara Hai (1993). His next production was Salman Khan – Sunny Deol starrer Jeet in 1996 that went on to become a huge hit and popularised Sunny's hook step in the song "Yaara O Yaara". His next, starring Salman Khan in a double role, Judwaa, created a benchmark in the actor's life and was recognised as a cult film. Har Dil Jo Pyar Karega starring Salman Khan, Rani Mukherjee and Preity Zinta (2000) and Mujhse Shaadi Karogi (2004) starring Akshay Kumar, Priyanka Chopra and Salman Khan were the next films he produced under his banner that also went on to become super hits. His 2006 film Jaan-E-Mann was commercially unsuccessful. Nadiadwala's 2007 release, Heyy Babyy, was a commercial success wherein he launched director Sajid Khan. His 2009 production Kambakkht Ishq, for the very first time in Bollywood included the casting of Hollywood stars such as Sylvester Stallone, Denise Richards and Brandon Routh. The film starred Akshay Kumar and Kareena Kapoor in the lead. Nadiadwala described the moment when he signed Sylvester Stallone for the film as historic since he was so star-struck by Stallone, as he was wondering whether he should get an autograph first or get the contract signed. His first film of 2010, Housefull held a stellar cast of Akshay Kumar, Ritesh Deshmukh, Deepika Padukone, Lara Dutta, Boman Irani, Arjun Rampal and Randhir Kapoor. The film on release became one of the highest grossers and established Housefull as a successful comedy franchise. On 30 September 2010, he announced a sequel to Housefull that would again star Akshay Kumar in the lead. His next film, a love story, Anjaana Anjaani starring Ranbir Kapoor and Priyanka Chopra released on 1 October 2010 and the music of the film was an overnight success with songs like Tujhe bhula Diya and Aas Paas Hai Khuda becoming all time chartbusters. Housefull 2 was released on 5 April 2012 and this franchise film went on to be a huge blockbuster by entering the 100- crore – club, commemorating Nadiadwala Grandson's first 100 crore film. In 2014, Sajid Nadiadwala came out blazing with four successful films including his directorial debut starring close friend Salman Khan, titled Kick, which is one of the All Time Top Grossers in Indian cinema. His first production in the year 2014 was Highway starring Alia Bhatt and Randeep Hooda, directed by Imtiaz Ali was a success at the box office. His decision to green lit film like Highway brought a lot of appreciation from the industry and audience alike. Next was 2 States, the diverse cultural love story starring Alia Bhatt and Arjun Kapoor in lead roles and directed by Abhishek Varman was yet another 100 crore club that catered to the class as well as mass audience. On 23 May 2014, his first movie starring two debutantes in lead roles Heropanti released. The movie stars Tiger Shroff and Kriti Sanon and has the second-highest opening for a movie starring debutantes. Nadiadwala made his directorial debut with the July 2014 release Kick, a remake of Ravi Teja's 2009 Telugu film Kick. The film stars Salman Khan and Jacqueline Fernandez as the leads. The film broke all previous Khan records and is one of the top 100 highest-grossing Indian films. Nadiadwala with this film also successfully resurrected Jacqueline Fernandez's Bollywood career and got the actress in many movies. The actress said about her Judwaa 2 producer, Sajid Nadiadwala, admitting that it was he who noticed her before anyone else, giving her the special appearance in Housefull song, "Dhanno" and then going on to cast her in Housefull 2 and his directorial debut, Kick. Fernandez said about the Sajid "My oldest equation is with him, his wife Wardha is my soul sister and I've watched his kids grow in front of my eyes. I'm in the movies because of him and I'll never forget that. I'll always be there for Nadiad and Salman". In 2015, Nadiadwala produced Kabir Khan's directorial Phantom starring Saif Ali Khan and Katrina Kaif. The national spy action saga was based on Mumbai Avengers on the aftermath of 26/11 Mumbai attacks and was widely appreciated film. "Afghan Jalebi", a song broke records and became the no.1 chartbusters. Next was the highly talked film, Tamasha starring ex flame Ranbir Kapoor and Deepika Padukone, directed by Imtiaz Ali. The film grossed 100 crore worldwide and is received much love and appreciation by the critics. The music album of the film became an instant super hit and is considered one of the top albums of the decade with songs like "Matargashti" and "Agar Tum Saath Ho" ruling the charts. In 2016, Sajid Nadiadwala had a yet another successful year, with three back-to-back hits, Baaghi, Housefull 3 and Dishoom. Baaghi, an action adventure film starring his protégé Tiger Shroff along with actress Shraddha Kapoor grossed 100 crore worldwide and established Tiger as an unbeatable action hero. The songs of the film became popular in no time. Next from Nadiadwala's banner, came his biggest Housefull franchise, the third installment of Akshay Kumar starrer. Housefull 3, broke box office records and grossed 107 crore in India. The multi- starrer film will have its sequel coming in Diwali 2019. Nadiadwala announced the fourth installment he said, “Yes, that’s right we intend to bring back the entire cast from the earlier Housefull films. Of course Jia Khan is no longer with us. God bless her soul. But all the rest are on. The idea for Housefull 4 came to Nadiadwala in a flash. "I just thought we’ve seen so many serious intense romantic films on the theme of reincarnation, you know Madhumati, Karz etc…why not a funny take on punar-janam? That was my idea. I shared it with my story writers. I thought they would take at least a year or two to crack it. But they came up with a terrific plot within no time. So yeah, here we are all set to do a rip-roaring take on reincarnation. We are looking ahead at making the most expensive comedy ever to come from our production house". Housefull 4 will be set in two time zones. One will be in the current times. The other will be set in Baahubali era where all the characters will get into costumes. Rangoon, starring Saif Ali Khan, Kangana Ranaut and Shahid Kapoor, was released on 24 February 2017. Sajid Nadiadwala's reboot version of his cult classic Judwaa, once again directed by David Dhawan titled Judwaa 2 broke the dry spell running at the box office in 2017. The film was a blockbuster and was this year's first film to have a great run. The film has become Varun Dhawan's highest-grossing film so far. Nadiadwala recently released Baaghi 2 starring Tiger Shroff and Disha Patani on March 30, 2018. The film has already crossed the 100 crore mark in just 6 days and with this film Tiger Shroff gets his entry in the 100 crore club. The film is a sequel to 2016's super hit film Baaghi that was highly appreciated for its action and also starred Tiger Shroff. The film earlier was slated to release on April 29, but due to the date shifting this year, Nadiadwala preponed the release date of the film. Nadiadwala is the only filmmaker who has preponed the release of his film, whereas everyone has postponed, showing sheer confidence and also announced the third instalment of the franchise even before the trailer was out. Nadiadwala is producing Super 30 starring Hrithik Roshan, based on Anand Kumar biopic will release on January 25, 2019. The film marks the first collaboration of these two powerhouses.Abhishek Varman's period drama, Kalank, which is expected to have a stellar cast of superstars, is set to release on April 19, 2019. The fourth sequel to his Housefull has been announced and is scheduled for release in Diwali 2019. The film is touted to be the biggest Housefull ever with a 75 Crore budget, only for its VFX and SX. Sajid Nadiadwala is also producing Nitesh Tiwari's next Chhichhore which is slated to release on 30 August 2019. Nadiadwala is also launching Ahan Shetty with the hindi remake of telegu superhit movie RX 100 which will be directed by Milan Luthria. Apart from this, Sajid Nadiadwala has already announced the 3rd instalment of the blockbuster franchise Baaghi, which will star Tiger shroff and will be directed by Ahmed Khan. Further details on the movie are yet to be announced. Nadiadwala married actress Divya Bharti on 10 May 1992. After 10 months of their marriage Divya died on 5 April 1993, after she slipped and fell from their fifth-storey window at their Tulsi residency at age 19. After Divya's death, he met his second wife Warda Khan, a journalist. Khan eventually proposed to Nadiadwala and on 18 November 2000, the two were married. The couple later had two sons. ^ "All for love". The Times of India. 18 February 2006. Retrieved 27 December 2011. ^ "Salman Khan's 'Kick' earns Rs 200 crore, becomes his highest grosser in India". IBN Live. 5 August 2014. Retrieved 12 December 2014. ^ "IIFA 2015: Sajid Nadiadwala Receives Best Debut Director Award For Kick". businessofcinema. 8 August 2015. ^ a b Gupta, Priya (January 18, 2014). "It's taken time for people to know Salman is a good guy: Sajid Nadiadwala". The Times of India. ^ "It's taken time for people to know Salman is a good guy: Sajid Nadiadwala". timesofindia.indiatimes.com. 18 January 2014. ^ "Zulm Ki Hukumat Cast & Crew". bollywoodhungama.com. ^ "Sajid Nadiadwala makes his first period movie Rangoon in 25 years as a producer". bollywoodhungama.com. 9 January 2017. ^ "Sajid Nadiadwala, The Hitmaker". rediff.com. 25 November 2015. ^ "Judwaa (1997) Full Cast & Crew". imdb.com. ^ "Box Office 2006". Boxofficeindia.com. Archived from the original on 14 October 2013. Retrieved 27 December 2011. ^ "Box Office 2007". Boxofficeindia.com. Archived from the original on 14 October 2013. Retrieved 27 December 2011. ^ "Nadiadwala signs Sylvester Stallone for his next film". economictimes.indiatimes.com. Retrieved 14 June 2008. ^ "Housefull's cast at Diesel's showroom". hindustantimes.com. Retrieved 1 May 2010. ^ "Sajid Nadiadwala thrilled with Anjaana Anjaani's success". mid-day.com. Retrieved 11 October 2010. . "The latter was a risk because I was not getting work at the time but both Nadiad and Salman showed a lot of confidence in me by going ahead with me in Kick. Nadiad then went on to give me Housefull 3, Dishoom and Judwaa 2. " ^ "Housefull 2 enters 100 crore club". hindustantimes.com. Retrieved 23 April 2012. ^ "All Time Top Grossers". bollywoodhungama.com. ^ "Sajid Nadiadwala elated as Highway becomes a Super Hit". indiainfoline.com. Retrieved 5 March 2014. ^ "Kick, Heropanti, Highway and 2 States get Sajid Nadiadwala 25 plus nominations at Screen Awards!". bollywoodlife.com. Retrieved 13 January 2015. ^ "Heropanti: A love story with an undercurrent of violence". timesofindia.indiatimes.com. Retrieved 27 May 2014. ^ "Special Features: Box Office: Heropanti vs Movies featuring Debutants — Box Office, Bollywood Hungama". bollywoodhungama.com. Retrieved 27 May 2014. ^ "TOP INDIA GROSSERS ALL TIME". boxofficeindia.com. ^ Singh, P. (27 May 2013). "Salman Khan to star opposite Jacqueline Fernandez in Kick". hindustan times. Archived from the original on 8 June 2013. Retrieved 12 June 2013. ^ "JACQUELINE FERNANDEZ HIGH ON SEQUELS". mumbaimirror.indiatimes.com. ^ "Jacqueline Fernandez outshines Taapsee Pannu in 'Judwaa 2'". timesofindia.indiatimes.com. Retrieved 4 October 2017. ^ "Aapka Kya Hoga - Dhanno (From "Housefull")". saavn.com. ^ "Sajid Khan and Jacqueline Fernandez on their Housefull 2 experience". telegraphindia.com. Retrieved 4 October 2017. ^ "JACQUELINE FERNANDEZ HIGH ON SEQUELS". mumbaimirror.indiatimes.com. Retrieved 19 December 2017. ^ "Showtime: "Afghan Jalebi (YA BABA)" from "Phantom 2015"". wired.com. Retrieved 8 November 2015. ^ "Box office collection: Tamasha crosses Rs 100 crore mark worldwide; Hate Story 3 to earn Rs 50 crore". ibtimes.co.in. Retrieved 12 December 2015. ^ "2016 - Set to be another BIG year for Sajid Nadiadwala and Eros with 'Dishoom'". indiaglitz.com. Retrieved 21 July 2016. ^ "Box office collection: 'Baaghi' grosses Rs. 100 crore in India; Tiger-Shraddha's film set to beat 'Kapoor and Sons'". ibtimes.co.in. Retrieved 11 May 2016. ^ "Sajid Nadiadwala: We intend to bring back the entire cast from the earlier Housefull films". urbanasian.com. Retrieved 8 November 2017. ^ "Housefull 4 will bring together the entire cast from the 3 earlier Housefull films in Baahubali style". bollywoodhungama.com. Retrieved 8 November 2017. ^ "It's out! Kangana, Shahid and Saif Ali Khan's 'Rangoon' release date set!". Zee News. 24 May 2016. Retrieved 24 May 2016. ^ "Varun Dhawan and Tiger Shroff are Sajid Nadiadwala's superstars. Here's why". timesnownews.com. Retrieved 6 April 2018. ^ "Post Baaghi 2'S Success, Tiger Shroff Thanks His Mentor Sajid Nadiadwala". mid-day.com. Retrieved 3 April 2018. ^ "Kalank: Madhuri Dixit, Sanjay Dutt start shooting for Abhishek Varman's period drama- Entertainment News, Firstpost". Firstpost. Retrieved 2018-10-01. ^ "Akshay Kumar and his gang to return with Housefull 4 on Diwali 2019". The Indian Express. 2017-10-27. Retrieved 2017-10-28. ^ "Dangal director Nitesh Tiwari starts shooting for Sajid Nadiadwala's next production Chhichhore- Entertainment News, Firstpost". Firstpost. Retrieved 2018-10-01. ^ "Nitesh Tiwari's next release in August 2019 - Times of India". The Times of India. Retrieved 2018-10-01. ^ "Baaghi 3 announced: Tiger Shroff stars in third installment of action franchise directed by Ahmed Khan- Entertainment News, Firstpost". Firstpost. Retrieved 2018-11-26. ^ "10 Secret Marriages In Bollywood!". Deccan Chronicle. 24 June 2014. Retrieved 27 April 2016. ^ a b "Sajid Nadiadwala buys Divya Bharti's song for Rs. 1.5 crore for 'Kick'". The Indian Express. 28 July 2014. Retrieved 27 April 2016. ^ Upala Kbr (12 November 2015). "I proposed to Sajid Nadiadwala, says Warda Khan". Daily News & Analysis. Retrieved 27 April 2016.